It was time to make the call. I decided to do a little digging into my family history. Mom’s grandmother (her mom’s side) had ovarian cancer, my grandfather (dad’s side) had prostate cancer, my dad had an issue with a tumor near his kidney, my mom was just diagnosed with ovarian cancer, one sister was 28 when she was diagnosed with breast cancer and died just a year later, and my other sister is healthy and has not been affected thus far (knock on wood). Although my own genetic test results were negative for the known BRCA mutations, my updated family history and recent personal history bumped me into the “high risk” category. Thus far everything that came my way via experience and information gave me more reason to move forward with the procedure. Other than the risks that go hand-in-hand with any major surgery, there was nothing significant that made me question if this is the right thing for me. What if the MRI uncovered that the masses in my breasts were cancer? What if it was a false-negative and by the time I felt the lumps myself, it was too late? Will I ever trust another ultrasound or MRI? And if I don’t do this and down the road breast cancer comes into my life, will I be able to live with the decisions I make now? So that’s it. Say tootaloo to the boobies. Time to part ways. 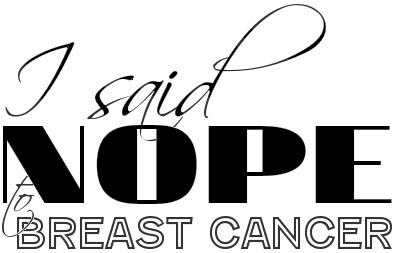 This entry was posted in All, My Story and tagged BRCA, breast cancer, family history, genetic test, health, mastectomy surgery, MRI, ovarian cancer, prostate cancer on November 20, 2012 by nope2BC.